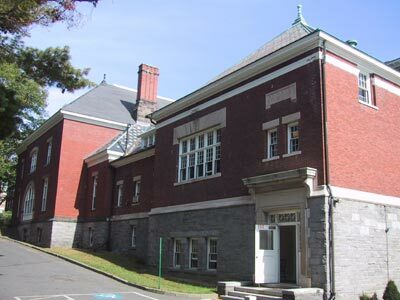 Pratt Gymnasium was built between 1883 and 1884, financed by gifts from Charles M. Pratt of the Class of 1879 as well as other donations and bequests. The building was designed by E. L. Roberts of New York, and Frederick Law Olmsted was the landscape architect. 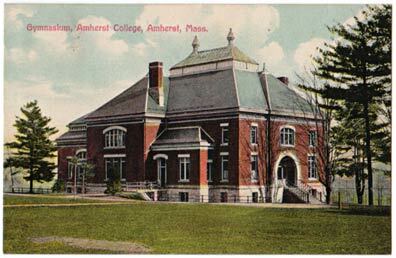 In 1904-05, the Harold I. Pratt '00 Pool was added, as were a set of squash courts, the gift of Mortimer L. Schiff '96. In 1941, work was begun to remodel the building into a home for the Geology Deparment, under the direction of James Kellum Smith '15 of the firm of McKim, Mead & White. The work was interrupted by war, and finished in 1950. The building is now known as the Pratt Museum, and holds a significant collection of Professor Hitchcock's dinosaur bones as well as other items of natural history (King, 316-17). (Photo taken 12 October 2001).